Argentina is where steaks are an art form. 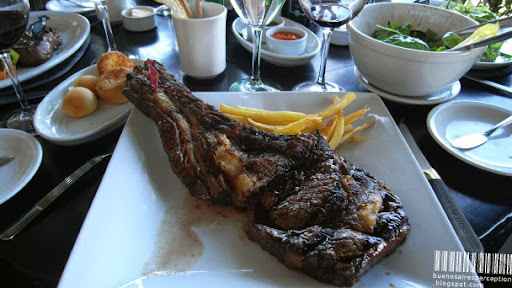 What you definitely can expect from Buenos Aires are prime steaks and meats in a lot of restaurants. This BIG one on the plate is the classic T-bone 800 gr. (1.76 lbs) garnished with some French fries. That grilled T-bone steak is BIG enough to feed a family of four hence you can imagine how hard it is to eat it all alone. What a waste! What else can I say? Size does matter and BIG is king when it comes to steaks! There's something else BIG to report: the estimated beef consumption. Well, the average Argentinean eats 68 kg (150 lbs) of red meat per year which makes Argentina the most carnivore nation on earth. Phew. 800 grams? That'd be enough to recruit quite a few new vegetarians. I had a steak half this size a while back and that was more than enough by any standard. Size does matter but so does taste. I wonder what this one would be like? That's a BIG monster! Uff da! A BIG meal of BIG meat and BIG calories! Happy theme day! That's a big steak. I though the USA is still number one at beef consumption but I checked and you're right. You guys are number one by far :) The USA comes second though. And you're right. It does seem like a waste. Plus, there will be no space left for dessert and that's a shame. You must have a lot of Cardiologists in Argentina. I have to admit that when I visited there, I had some huge steaks at very reasonable prices. What strikes me about your photo is the small amount of French fries. It makes me think about a place I get steak here in Phoenix. When the plate is placed in front of me the ratio between steak and fries is pretty much the opposite of this. I don't think I could eat all of that! It's huge! Excellent theme post. Lois Anne is a vegetarian. This would make her gag. I haven't eaten beef for years, but will eat chicken or fish. This is, truly, a heart attack on a plate! Reminds me of an episode of the Simpsons, where a truck driver actually dies from eating one of those monsters! 800g..... I think I'll pass. Not that I could eat that big a steal alone, but it does look delicious. You are certainly known for being a country of beef eaters...nice shot!!! The enormous slab of meat does look rather gross, but the rest of the table looks so fine. Giant would be a better word!!!! And despite these giant steaks, the streets of Buenos Aires are full of very healthy looking people. I guess its the french fries that are less healthy than good quality meat. Is that from Cabaña Las Lilas or do they use cow markers in other restaurants as well? You're right with your guess about the restaurant. You have a good eye. (; I didn't mention the name cause I don't want to promote them in particular. There are many other less expensive restaurants in Buenos Aires with the same quality of food. Abasto de Buenos Aires — Shop until You Drop! La Boca - Barrio Bonito?